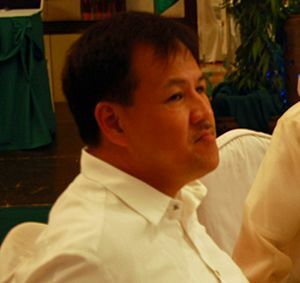 Jesse Manalastas Robredo (May 27, 1958 – August 18, 2012) was the Secretary of the Interior and Local Government of the Philippines. Robredo was a member of the Liberal Party. On July 9, 2010, President Benigno Aquino III named Robredo as Secretary of the Interior and Local Government. Robredo was a former Mayor of Naga City in Camarines Sur. He was the first Filipino Mayor to receive the Ramon Magsaysay Award for Government Service in 2000. On August 18, 2012 (PHT), the aircraft carrying Robredo crashed off Masbate bay. He was scheduled to attend a political event in Naga City. The Philippine Department of Interior and Local Government said that the pilot sent a distress call to the Masbate airport. The pilot was requesting an emergency landing. The plane never made it to the airport and crashed in the ocean. His body was retrieved three days later, August 21, 800 meters from the shore and 180 feet below sea level. At the time of his death, Robredo was survived by his wife, Vice President Maria Leonor Gerona Robredo, and three daughters in addition to his elderly parents (including an only mother-in-law) as well as his siblings. His funeral was held at the Archbishop's Palace in Naga City before it was transferred to Malacañang Palace for an official wake on August 24, 2012. His remains were later brought back to his hometown of Naga and cremated. 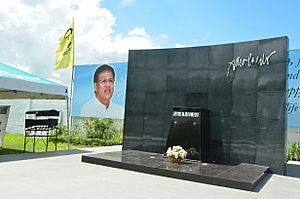 Robredo's ashes are entombed at the Eternal Gardens Memorial Park. Following Robredo's death, August 18 was declared "Jesse Robredo Day". In addition, two roads were named in his honor, Sec. Jesse Robredo Avenue in Naga City, Camarines Sur and Jesse M. Robredo Boulevard, in Masbate City. Naga City also hosts the Jesse M. Robredo Center, the Jesse Robredo Coliseum, and the Jesse Robredo Monument and Museum in the town centre. Jesse Robredo Facts for Kids. Kiddle Encyclopedia.